FileProtect is a file sharing and cloud storage solution with secure messaging and enterprise level security. 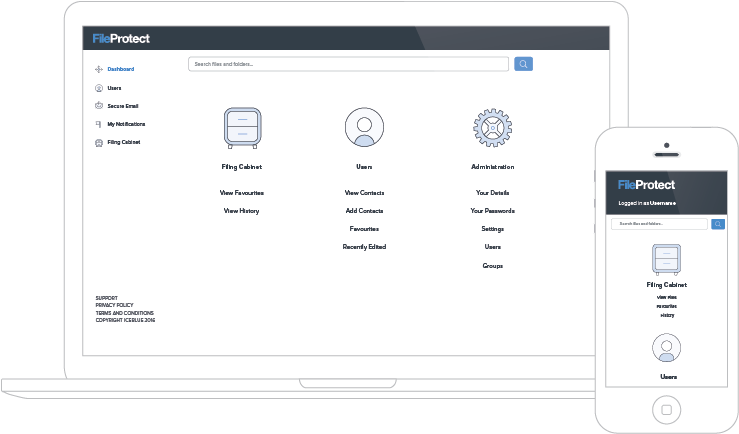 The platform allows clients to upload documents to their secure cabinet for instant retrieval, without the restrictions on file sizes commonly experienced through standard email providers. We put security at the heart of the portal and in line with the new General Data Protection Regulation, we offer a secure messaging service that allows you to attach documents and send anything with sensitive information within the portal to your clients and contacts. FileProtect streamlines your workflow and can be seamlessly integrated into your business through white labelling, an extension of the service you can offer your clients, suppliers and staff. This ensures your branding remains consistent, professional and recognisable at all times.